NETWORK UPDATE: The US OPEN remained at its morning rating, and there were no other adjustments. CABLE HIGHLIGHTS: Lifetime’s A DEADLY ADOPTION, a quasi-prank from Will Ferrell and Kristen Wiig, won the night at 0.63. (A Hallmark original movie PERFECT MATCH was far behind at 0.16.) Adult Swim’s late night block remained strong, with KILL LA KILL up 0.03 to 0.55, and SWORD ART ONLINE up 0.05 to 0.54. In addition, we’re informed that the rest of the Adult Swim block includes quasi-originals that haven’t been shown in their current form on US TV, and MICHIKO & HACHINI was at 0.55, DRAGON BALL Z was down 0.13 to 0.51, and NARUTO was at 0.51. (Their F12-34 ratings were respectively 0.57/0.53/0.52.) A more peaceful piece of animation was Nickelodeon’s RABBIDS INVASION, up 0.16 to 0.53, and on Cartoon Network, POKEMON was down 0.05 to 0.35. POWER (Starz) slipped 0.02 to 0.50. An original COPS on Spike was at 0.37. HOUSE HUNTERS RENOVATION (HGTV) fell 0.07 to 0.34. 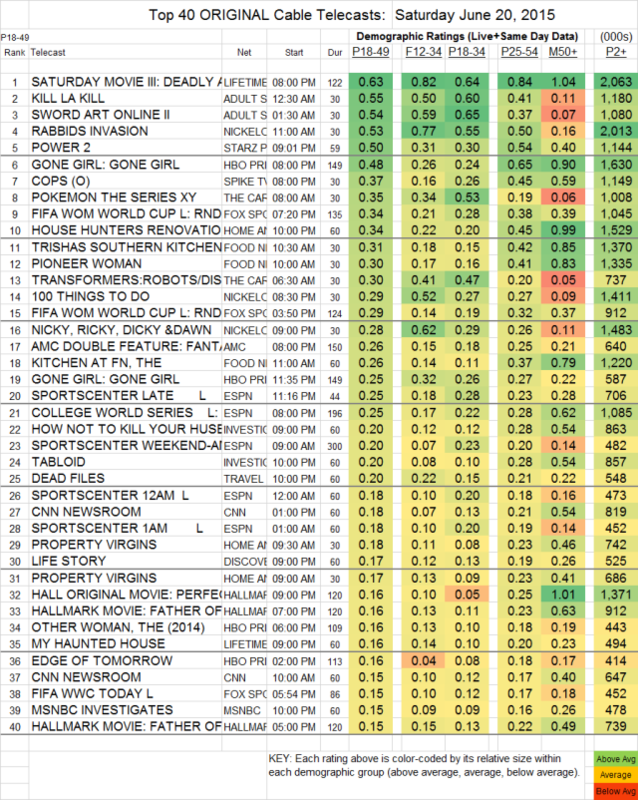 The highest rated sports telecast of the day was a WOMENS WORLD CUP match on Fox Sports 1 at 0.34. The season finale of ORPHAN BLACK on BBCAmerica was up 0.04 to 0.15, and JONATHAN STRANGE AND MR. NORELL held at 0.07. A final note: HBO insists on listing its theatrical movie telecasts as “originals,” which is how they wind up on the chart, and while we usually ignore them, it’s worth noting that GONE GIRL scored a particularly high 0.48 for its first airing.